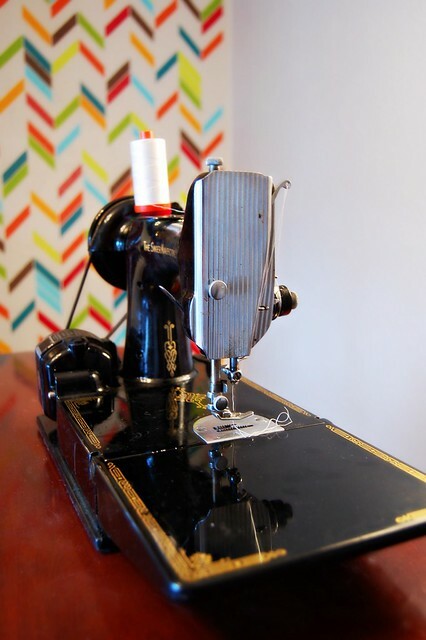 Introducing Ethel, my “new” Singer Featherweight 221! 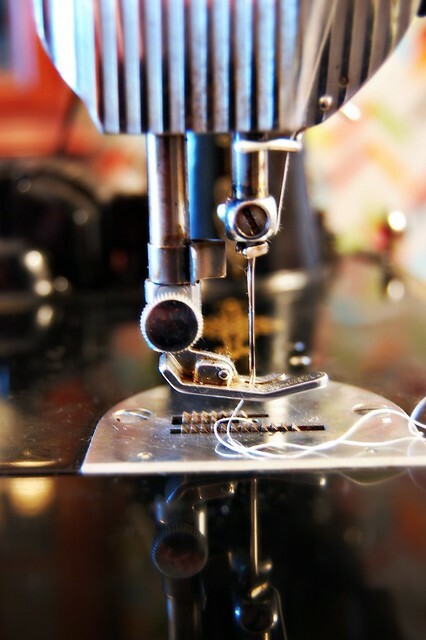 I’ve wanted a backup sewing machine for a long time, simply because I fear the day that my Janome may need servicing while I’m in the middle of a big project, and then what would I do? Not sew?! So I showed my husband my “just dreaming” machine, and he surprised me by telling me to go ahead and buy one, we’d call it a Valentine’s present. (When you’ve been married more than 20 years, Valentine’s kind of turns into an “I know you’re going to end up buying that anyway, so maybe I want credit for it” event, and it’s all good. :) ) Even though the machines are quite old, good machines really aren’t hard to find. I purchased mine from a seller on Etsy, where there are several more to choose from. Prices seem to range from $275 to $500 or more, depending on the condition of the machine and its accessories. 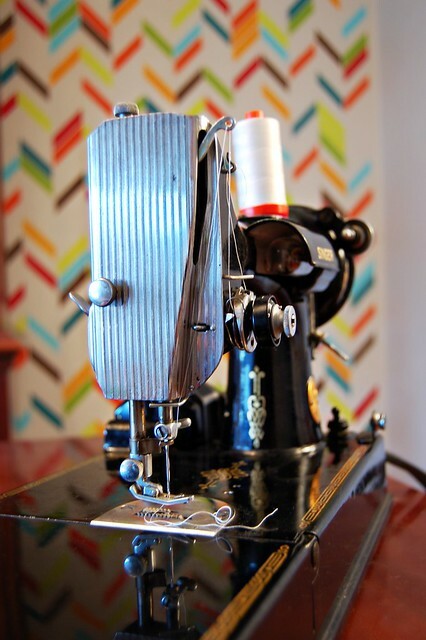 One of the wonderful things about a Featherweight is that you can do most or all of the service for it yourself at home for very low cost. I suggest buying the book The Featherweight 221 and I by David McCallum for wonderful care and repair instructions. 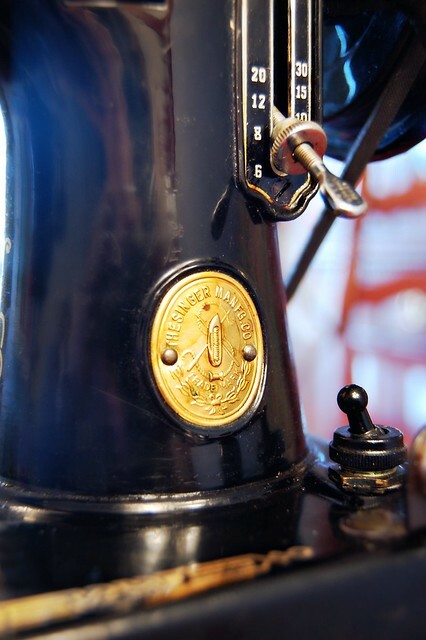 With a little research, I learned that my machine was built on March 31, 1950 and sold for $140. In today’s dollars, that would be $1,372.07, which makes me feel like I got a real bargain. Another thing I love about Ethel — she has tattoos, just like Kanye! She’ll fit in around here just fine, won’t she? She stitches beautifully, but I still have days worth of cutting before I’m anywhere close to starting on my next project. 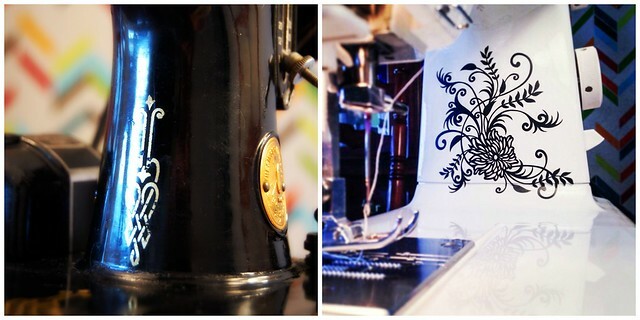 I’m very excited about piecing my next quilt on this sewing machine! If you’re interested in learning more about Singer Featherweights, I found this post by Jeni at In Color Order very helpful. Congratulations! I’ve always wanted a Featherweight but haven’t taken the plunge yet. Thank you, Sarah! I’m still getting to know it, but it’s so quiet and its stitches are so perfect and neat, I just love it. A friend of mine told me she “accidentally” bought one in a little table at a yard sale in 1992 for $10. If only, right?